C Standard Library: An online C Standard Library Reference Guide by Eric Huss. Nate Robin’s OpenGL tutor programs . Richard Szeliski’s Computer Vision: Algorithms and Applications. Week 1: Intro to Computer Graphics using OpenGL. Reading #1: due Monday, Feb. 2. OpenGL reading: (i) Browse through the following articles on OpenGL, glu, and glut. (ii) Read all in sections 2 and 3 entirely, and the subsection 7.1 of GLUT 3.0 specification. (iii) Browse through Chapter1 (skip the part on the OpenGL Programming Guide Auxiliary Library) of OpenGL Programming Guide. Sample code to examine: Try to understand the sample programs: simple.cpp and earth.cpp. Sample executables to explore: (i) Play with projection.exe, lightposition.exe, and shapes.exe from Nate Robin’s tutor repository to learn about the synthetic camera model and the basics of OpenGL primitives for drawing 2D geometric objects. 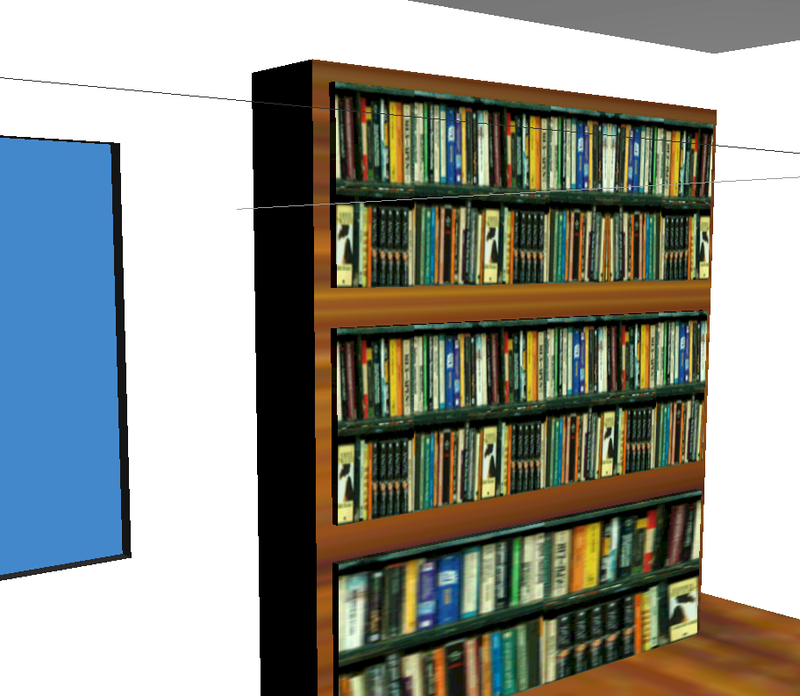 (ii) Download this 3D modeling of a dorm room (by Philip Hagelberg for CSCI440 2004, executable only.) and run the executable to have a walk through the room (see some screenshots 1 2 3). (iii) See the manuals and executables from sample final projects in 2011. Lab #1: due Monday, Feb. 2. Lab #1: Create a Simple Static Scene Viewed from a Static Camera with Orthographic Projection. Submit all your source code files (.cpp and .h files) together with the self-evaluation report as a single zip file under Canvas. Reading #2, due Monday, Feb. 9: (i) Chapter 2 of the OpenGL Programming Guide on state management and geometric objects. (ii) GLUT 3.0 specification: Sections 2~3 on initialization and the event loop, Sections 7.1~7.6 on registration of basic callback functions, Sections 4.5~4.6 on posting a redisplay event and the swapping of double buffer. Lab #2: due Monday, Feb. 9. Lab #2: A Simple Dynamic Scene: Viewing Moving Objects from a Static Camera with Orthographic Projection. Submit all your source code files (.cpp and .h files) together with the self-evaluation report as a single zip file under Canvas. See the sample executables for Lab 2: (a) by Philip Myers (press the keys q, w, 1, 2, 3, 4, 5, 6 to see the effects) and (b) by Chris Barry. Demo program: Icosahedron and subdivision to approach a sphere from Chapter 2. Reading #3, due Monday, Feb. 16: (i) Read Chapter 3 of the OpenGL programming guide. (ii) Play with transformation.exe from Nate Robin’s tutor repository to explore the effects of 3D transformations and its relationship with the GL_MODELVIEW matrix stack. (iii) This brief review of 3D Geometry. Lab#3A: A Simple Static Scene Viewed from a Moving Camera with Perspective Projection (See this sample Windows executable solution zip file for Lab #3A and press the keys j, k, i, m, x, y, z to change the dynamics of the scene) Due: Monday, Feb. 16. Demo program: Computer graphics and photo-realistic scenes: See an interesting video and the related news here. Week 4: More on Model-View Transformation and Projection Transformation. Reading #4, due Monday, Feb. 23: (i) Read this brief review of 3D Geometry (ii) Carefully reexamine Chapter 3 of the OpenGL programming guide again and reexamine transformation.exe and projection.exe from Nate Robin’s tutor repository to make sure you understand how model-view transformation and projection transformation are supported in OpenGL. Lab#3B, Due: Monday, Feb. 23: A Dynamic Scene Viewed from a Moving Camera with Perspective Projection (See the three sample executables in this solution zip file for #3B). Reading #5, due Monday, March. 2: (i) Play with this sample program about Sierpinski gasket fractal and watch the console application to see the difference between the windows coordinates you get from the mouse events and the world eye coordinates of objects in the world. Press the keys 1 and 2 to switch between two reshape event handlers to see two different ways to preserve the aspect ratio when the user resize the window. (ii) Read Section 11 of glut specification about the rendering of the teapot, cube, sphere and read the blue book regarding the use of GLUquadricObj, gluNewQuadric, gluQuadricDrawStyle, gluCylinder, gluSphere, gluDisk, gluPartialDisk. (iii) Play with this planet program (press d, D, y, Y to see the effects) from Chapter 3 of the OpenGL programming guide on mode-view transformation using glRotate, glScale, and glTranslate. In-class programming test#1, Wednesday, Feb. 25. Range: Concepts and techniques in Reading #1~#3 and Lab#1~Lab#3B. 1. Consider the sample code here (from Chapter 2) that can approximate a unit sphere centered at the origin (0,0,0) by applying the subdivision technique recursively for a number of times to the basic geometry of a standard icosahedron centered at the origin (0,0,0). 2. (i) Develop a function void myUnitSpehere(float x, float y, float z, int depth) that will approximately draw a unit sphere with radius 1 centered at (x,y,z) by applying the subdivision techniques recursively for depth times to the geometry of a icosahedron now centered at (x,y,z). (ii) Develop void mySpehere(float x, float y, float z, float r, int depth) that will do the same thing like myUnitSpehere but to approximate a sphere of the given radius r.
1. See the sample Windows executable in this zip file modeling a 3D bouncing ball, which call the sphere function in problem #1 to render the ball. Re-examine the main function in this zip file from CSCI 105 Intro to Computer Science that can render a 2D bouncing box contained in a 2D square using a collection of 2D drawing functions. Make sure you understand how they model 2D velocity, the change of velocity when hitting a 2D wall, and the effect of gravity when it is turned on. 2. (i) Develop a program that can render a 3D bouncing ball contained in a 3D box using OpenGL from a fixed view. (ii) Incorporate the effect of a moving camera 3D like what you did on Lab #3A and #3B so that the user can view the bouncing ball contained from a camera rotating around the Y axis. (iii) Incorporate the keyboard commands such that the user can (1) stop the camera or keep it moving around its orbit, (2) increase or decrease the radius of the camera’s orbit, (3) increase or decrease the camera rotation speed, (4) stop the ball or keep it moving, (5) turn the gravity effect on or off, (6) set a random speed for the ball, and (7) increase or decrease the current speed of the ball. Lab#4A, due Monday, March. 2: Composing Static Scenes Using Basic Geometric Objects and Model-View Transformation. Lab#4B on Model-View Transformation and Geometric Objects: Due March. 9. Model the Biola bell tower in 3D, including the three pillars, the bells, the ground supports. Allow the user to view it either from a fixed camera location or through a camera automatically circling around the bell tower. Download and play with the sample executables for Lab 4A and Lab 4B here. Lab#4C on Menu Creation and Menu Callback function: Due March. 16. Enhance your Biola bell tower graphics program in Lab4B to (i) show the X, Y, Z axes in addition to the bell tower and (ii) add a menu and implement the related menu event handlers such that the user can select one of X, Y, and Z axes to have the camera automatically circle around the selected axis to view the scene. In other words, there should be 4 entries there in the menu, one for selecting X as axis for automatic movement, one for selecting Y as axis for automatic movement, one for selecting Z as axis for automatic movement, and one for stopping the automatic movement. 1. Download and play with this zipped source code and an executable to find a sample 3D scene modeler (S.H. Lin 2006). You can either right click to select different operational modes to press enter to rotate around modes. See snapshots 1 and 2 and use it to load this 3D scene model for viewing and exploration. 2. To learn about new features used in the scene modeler, please read (i) the following parts of GLUT specification: section 6 on glutCreateMenu, glutAddMenuEntry, glutAttachMenu, section 7.5 on glutMouseFunc, and section 9.1 on glutGet, (ii) the related sections of Online OpenGL 1.1 reference guide on glGetDoublev, glGetIntegerv, and gluProject, (iii) the usage of acos and fabs in <cmath> of C++, and (iv) Chapter 4 of OpenGL 1.1 programming guide on colors. 3. To understand how the new features are used in the scene modeler, (i) download and play with this compact XYZ movement example (sample code and an executable included) demonstrating the implementation of an advanced glut mouse motion function to translate dragging events into actions along X, Y, Z axes, and (ii) download and play with this example program on the setup of a menu system using GLUT. Examine the code to understand the underlying implementation. Week 8: Lighting and Material. (i) Chapter 5 on lighting and materials from the Online OpenGL 1.1 programming guide. (ii) Play with lightposition.exe and lightmaterial.exe from Nate Robin’s repository to get a sense of the issue of light and materials and do experiments with the sample code by trying different values for the related light and material parameter to create similar effects you see in Plates #13, 16, 17 in the appendix of OpenGL Programming guides. (iii) Examine this sample code as an example of the use of the depth buffer + depth test and the setup of light and material. You should do experiments with the sample code by trying different values for the related light and material parameter to create similar effects you see in Plates #13, 16, 17 in the appendix of OpenGL Programming guides based on your understanding of Chapter 5. (i) You need to present your scenario (Task #1) and your prototype (Task 2) for Formation Stage I (see below about the details of Formation Stage I) in the class. (ii) After the presentation, upload all your source code files and this Formation Stage I Progress Report as a single zip file under Canvas to get the credit. · Purpose: In this formation stage, we want to get a taste of developing a very basic 3D games by creating a prototype around the framework of the bouncing ball in Programming Test#1. · Basis: (i) The code framework of the bouncing ball you develop for Programming Test#1. (ii) Optional: Play with the executable in the castle example to see how the user can navigate in the environment through the keyboard (try the keys: a, d, w, s, x, y, c, v, f, r). As an example, you can examine the source code there to understand the ideas and the use of a camera class and keyboard controls to provide a basic user interface for navigation in a virtual world. · Task 1 (Formation of the Scenario): Describe your ideas of developing a basic 3D game based on the framework of the bouncing ball in the programming test#1. You also need to provide a coherent scenario of the game meeting the following two requirements. Requirement 1 (Dynamics in the environment): You should have two or more bouncing balls in the virtual environment to interact with the user in some way(s). For example, one of the bouncing ball may represent a bomb, and a bomb hitting the user may mean end of game. Maybe the user can fire a bullet (as another ball) may destroy or deflect the trajectories of the bouncing balls. Maybe the user represented as a flat object can move around to hit the bouncing balls to deflect the trajectories of the bouncing balls and to direct them to hit some target. Or maybe the user on a spacecraft represented as a bouncing ball can press the keys to fire up its engine in a burst in certain ways to change the direction and the speed of movement to capture the bouncing balls for credit, and so forth. Requirement 2 (Rewarding mechanism in the environment): Your virtual environment should have a mechanism for rewarding or encouraging the user for exploring the environment. For example, capturing a bouncing ball may end in certain credit points, firing the engine for a burst may consume some points, and successfully docking the ship at some point may lead to a promotion to the next level of game, and so forth. · Task 2 (Implementing a prototype): You should (i) implement a prototype of your ideas and (ii) provide a very simple user manual about the scenario and the commands for playing your game. · Submission: You need to present your scenario (Task #1) and your prototype (Task 2) in the class. After the presentation, upload all your source code files and this Formation Stage I Progress Report as a single zip file under Canvas to get the credit. Range: Concepts and techniques in Reading #4~#8, especially focusing on (i) model-view transformation and (ii) lighting and materials. Practice Problems: Examine the basic demo program here and practice in advance about the following things. 1. Basic geometric modeling: Write a bus function that (i) models the bus using geometric primitives and/or basic objects provided by glu and/or glutcan and (ii) renders the bus centered at the origin if no model-view transformation is applied when it is rendered. For example, you can model the bus in terms of (i) a scaled cube as the body, (ii) one torus for each wheel, and (iii) a rectangle for each of the windows, the front lights, the brake lights, and the plates. 2. Animation through model-view transformation: Use model-view transformation appropriately together with the bus function to create the animation of the bus moving around a fixed point (0, 0, -4) in a circle with a radius 2. 3. Lighting: Model two light sources. One is statically located at (0, 4, 4) that is behind and above the static camera. The other one is attached to the front of the bus and thus should dynamically move as the bus moves. Set up an attached menu such that the user can turn each of two light sources on or off independently. 4. Materials: Set up additional subjects in the scene, including at least (i) a couple static buses (by using the bus function together with model-view transformation) parking nearby at different locations with different orientations and (ii) things about the grounds and around. Set up the material properties differently for these subjects to render some of the visual effects in Plates #16 and 17 in the appendix of the OpenGL red book. Final Project: Formation Stage II, due Monday, April. 13. · Purpose: In formation stage II, we want to add additional elements into the framework you proposed in the previous stage and continue to polish the prototype your 3D game. · Basis: (i) The code framework you develop for formation stage I. (ii) OpenGL functions for lighting and materials. · Task 1 (Adding elements into your scenario): Describe your ideas of adding new elements into your 3D game framework done in formation stage I. Requirement 1 (Dynamic interaction in the environment): Describe how you may incorporate into your storyline some mobile objects such as the two moving trucks in that either automatically move around the environment all the time and how they may trigger dynamic interactions with the user in some way. For example, you may have a wumpus monster (e.g. in the form of like a weird truck) wondering around all the time, and the user needs to escape from or destroy the wumpus monster when it gets close to avoid destruction. Or the other way around, you may have a moving shelter (e.g. in the form of like a shield, …) wondering around all the time, and the user can hind in it or behind it to avoid destructing flying objects. How will that enhance the storyline? Requirement 2 (Lighting with a moving spotlight): Describe how you may incorporate into your storyline one additional light source that acts like a spotlight (e.g. see here) and attach it to one moving object so that it can move around to light up the virtual world in a dynamical way. How will that enhance the storyline? Requirement 3 (Materials): Describe how you may incorporate into your storyline objects of different material properties with the appearances of shiny metal surfaces, clay, soil, cloth, …. How will that enhance the storyline? Requirement 4 (Depth test): Use the depth buffer and enable the depth test. · Task 2 (Implementing a prototype): You should keep (i) polishing your prototype by implementing and adding more elements into the virtual world according to your ideas described in Stage I and Stage II and (ii) updating your user manual about the scenario and the commands for playing your game. · Submission: You need to present your updated scenario (Task #1) and your prototype (Task 2) in the class. After the presentation, upload all your source code files and this Formation Stage II Progress Report as a single zip file under Canvas to get the credit. Formation Stage II presentation: Monday, April. 13 and Wednesday April. 15. Formation Stage II Progress Report due Wednesday April. 15. Reading #9: due Monday, April. 13. (i) Read Chapter 5 on lighting and all the things in Reading #8 again to make sure you can handle lighting and materials as required in Formation Stage II. (ii) Play with lightposition.exe and lightmaterial.exe from Nate Robin’s tutors again. (iii) Examine and play with the code here. Reading #10: due Monday, April. 20. (i) Chapter 9 on texture mapping from the Online OpenGL 1.1 programming guide and understand these key OpenGL texture mapping commands. Play with texture.exe from Nate Robin’s tutor repository to get a sense of the issue of texture mapping. (ii) Carefully examine how we can generate a texture from a picture in the tga format using the CreateTexture function declared in tga.h and implemented in tga.cpp and map the texture onto surfaces in case (a) where multiple images are mapped onto various surfaces in a static scene and in case (b) where one images is mapped onto various surfaces in a dynamic scene. (iii) Also see in case (c): about the mapping of a checkerboard image onto a glutTeapot object, and case (d): about the mapping of two checkerboard images onto two rectangles. (iv) Optional: You may also explore the Simple OpenGL Image Library that supports the loading of most popular image formats for texture mapping. Reading #11: due Monday, April. 27. (i) Chapter 6 on blending, anti-aliasing, and fog from the Online OpenGL 1.1 programming guide and examine the code in alpha.cpp and run the program (pressing t to see different blending result) (ii) Carefully examine how you can also control which faces OpenGL considers to be front-facing with the command glFrontFace in "Reversing and Culling Polygon Faces" in Chapter 2. (iii) Examine the descriptions about the two-sided lighting in "Selecting a Lighting Model". (iv) Examine "Defining Material Properties" for information about how to supply material properties for both faces. (v) Play with this demo and carefully examine the code to understand issues regarding two faces of a surface, face culling, and texture mapping. (vi) Optional: You may also explore the Simple OpenGL Image Library that supports the loading of most popular image formats for texture mapping. Lab#5: Due Monday, April. 27. Enhance the graphics program you have for Lab#4C with texture mapping on the ground (adding a rectangle into the scene to serve as the ground) and at least a couple of other surfaces. See a sample demo here. Reading #12: Report Due: Monday, May 4. Play with this demo and carefully examine the code to understand issues regarding two faces of a surface, face culling, and texture mapping. Chapter 12 on Evaluator and NURBS from the Online OpenGL 1.1 programming guide. Take turn to include into the project, compile, and then run separately each individual .c program alone (i.e. bezcurve.c, bezsurface.c, bezmesh.c, and bteapot.c) under the project folder in this BezCurves.zip to understand how these key commands for automatic interpolation of curves and surfaces work. Read the following Wikipedia articles on Bézier curve and NURBS or this slide sets. In-class programming test#3: Monday, May 4. Range: Concepts and techniques in Reading #9~#11, especially focusing on (i) texture mapping and (ii) blending and fog. 1. Texture mapping: Revisit your modeling of the bus scene in Test #2 earlier and examine the texture mapping in Plate 29 and Plate 30 in the appendix of OpenGL red book. Incorporate texture mapping into your modeling of the bus scene in Test #2 such that we have hills and grass (and maybe buildings) textured in the scene somewhat similar to what we see in Plate 29 and Plate 30. Reading #13: Report Due: Monday, May 11. Play with this demo and see the see the comments in the main function about the use of a texture loader for .bmp files. and glutBitmapCharacter to display text information in your 3D world. Browse through Chapter 10 on the framebuffer of the Online OpenGL 1.1 programming guide. Final Project: Formation Stage III, due Monday, May 11. · Basis: (i) The code framework you develop for formation stage II. (ii) OpenGL functions for texture mapping, fog, and blending. Requirement 1: (Texture mapping): You must apply texture mapping to some surfaces. For example, you may consider texture mapping used on the ground, the floor, the walls, the ceiling, the desks, and so forth. How will that enhance the storyline? Requirement 2: (Fog or blending): You must incorporate some bending or fog (or both) into your virtual world. How will that enhance the storyline? Requirement 3: (Automatic bird-eye view of the environment): You must provide some mechanism of automatic movement of the camera (for example, rotation of camera around a circle or a sphere while looking at the center of the environment) to provide an easy dynamic overview of the environment. · Task 2 (Implementing a prototype): You should keep (i) polishing your prototype by implementing and adding more elements into the virtual world according to your ideas described in Stages I~III and (ii) updating your user manual about the scenario and the commands for playing your game. · Submission: You need to present your updated scenario (Task #1) and your prototype (Task 2) in the class. After the presentation, upload all your source code files and this Formation Stage III Progress Report as a single zip file under Canvas to get the credit. Reading #14: Report Due: Monday, May 18. Browse the official documentation of The OpenGL Shading Language. · Monday, 1:30~2:30pm, May 25: Present your prototype if you haven’t done the presentation for the 3rd formation stage yet. Requirement and Submission: Please carefully read the descriptions of specification, requirements, evaluation, and things to submit. Examples from the previous years: See manuals and executables from sample final projects in 2011. Examples based on WebGL: See WebGL showcases such as 1, 2, 3, 4. An interesting demo of 3D models in a virtual world. Explore this collection of interesting OpenGL sample code, including an interesting demo of a fountain and pebbles using the OpenGL blending mechanism.